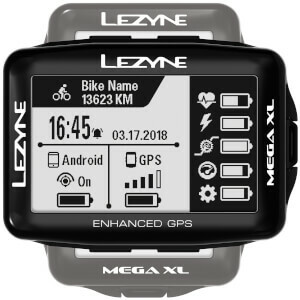 The ultimate in GPS technology, our new Mega XL is a must have device for serious road, gravel and mountain bike riders and racers as well as long distance adventure riders. Its 2.7-inch, 240x400 high-resolution display is 50-percent larger than our Super GPS and includes the option of vertical or horizontal viewing modes. The bundle version comes with a heart rate monitor and, speed and cadence sensor, making sure you can start using the very best data from this device straight away. I like the product. It could connect with my sensors with no problem. There is slight delay for the initial detection, which is acceptable for my side. I am also impressed with navigation feature of lezyne. Simple but effective. Most of all, you don’t have to worry about battery derainage anymore. I almost give my garmin edge to my friend. However, I soon reallize that it does not compatible with my smart trainer. Big deal for me. :( I hope they will support it some day. Until then, I would keep both garmin and lezyne. Does all it says it does! The display is great, connects flawlessly with all sensors and the maps are quite good! Battery life is outstanding! Upgraded from the original Lezyne GPS and glad I did. Screen size is great and the customizing options are pretty good (2-10 different values and 5 screens you can scroll through. I’ve set up 2 bikes and it picks up the sensors on each perfectly after selecting the bike you want as startup. The app and mapping is also pretty good and the auto sync is a big improvement. I haven’t used the navigation yet as know most of the routes but will test this our soon. Am sure it will perform just as well as everything else.